To me, Christmas starts today. In Finland, and from what I understand, a lot of other places in Europe, December 24th is the day to celebrate. We still call it Christmas eve, but it is the day of the main event, a.k.a. Santa. As a kid, it is the biggest event, pretty much of the year, as Santa actually comes by. After dinner (How does he know every year when dinner is done?) he shows up for a little bit before heading off to see other kids. Last week I asked for opinions about continuing the mail related posts on Mondays and since it seems to be liked, I will continue it for now. And I am bringing mail Mondays back with a bang! 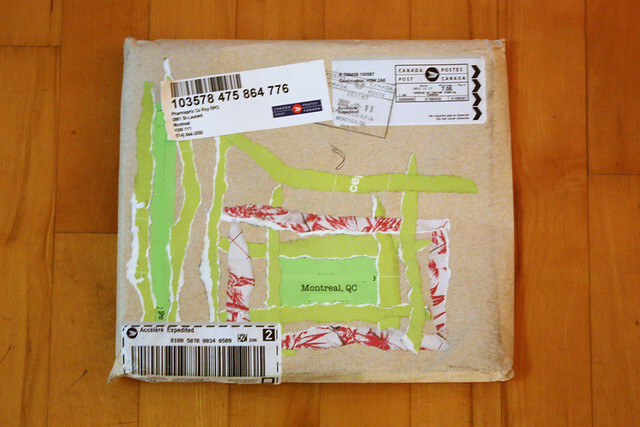 It's holiday mail time, so I can guarantee that this has been the busiest week since I started tracking my mail. 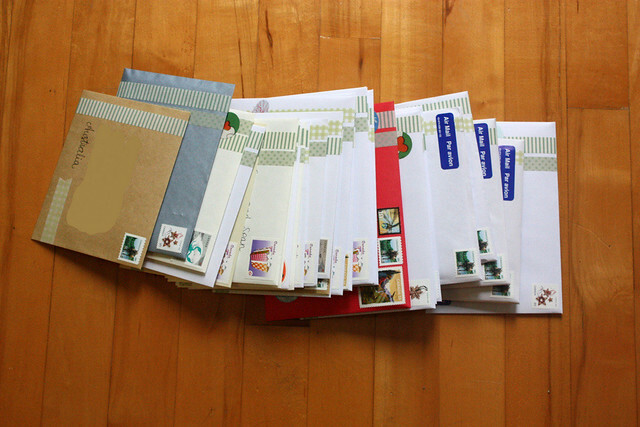 Here's the pile of mail I took out at one go. 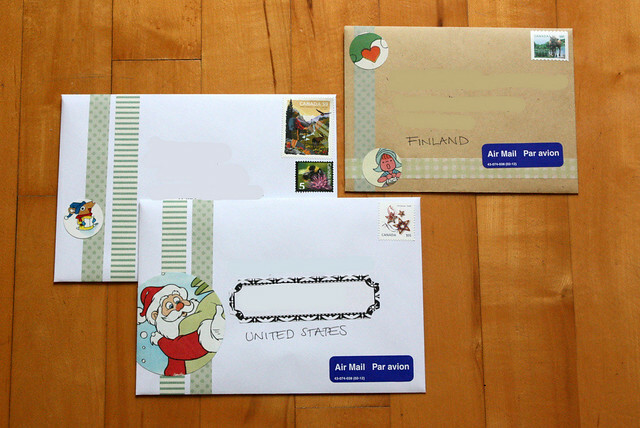 I counted I sent around 40 pieces of mail the week I sent out my holiday cards. Below are a few samples of the envelopes I sent out. 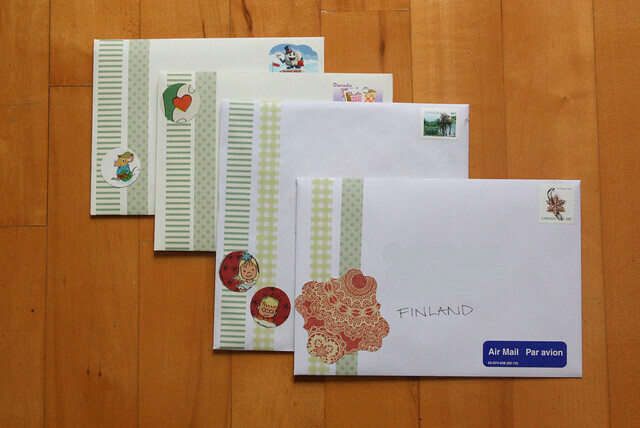 I used different green washi tapes to add different patterns to the envelopes. I then tried to add different types of embellishments on top. Here you can see round cutouts from books or a more shapely one from patterned paper. 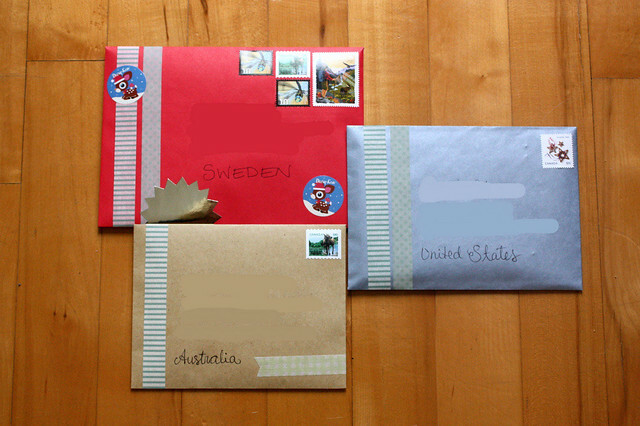 A lot of my envelopes were white, but I did add some colorful ones in the mix as well. Not that it really matters since the only time they are all in a pile is when I took the photos. There are some cards that went out to families with young kids. I tried to add a little extra on those ones with a Disney Santa and whatnot. Of course, if you look at the previous photo, there are some Sanrio Deers that certainly are not going to any kids. Overly-cute, big-eyed deer are not just for kids, right? I also got quite a few things in the mail... There were quite a few cards with pictures of the family sending it, so I'm obviously not showing you those ones. I didn't ask for permission, nor do I think people were expecting to see their family Christmas cards on the interwebs. So, I'm only showing you some of the envelopes for now. I have apparently also been very nice this year, as I got a few packages in the mail too! This is one of them, the other two are in Amazon packages, I figure you've all seen those at one point or another. 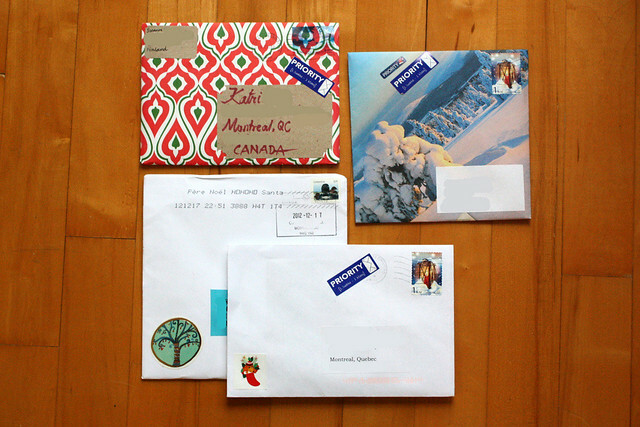 So, did you get any fun holiday mail? Did you send any out?